Lebanon presents an interesting case when it comes to social policy. In fact, when the developmental state model was being implemented all over the world, Lebanon was adamant in its laissez-faire economy. The developmental state has brought about welfare regimes and what was called welfare states in advanced capitalist economies in Europe. In parallel, except for a few years, Lebanon has opted for minimal state intervention in public policy, and social protection in general. This has been exacerbated in the reconstruction period where the private sector and non-state actors dominated the realms of social services and protection, such as health and education. In recent years, and with social protection gaining momentum on the international level, the discussion on social protection and social security resurfaced in Lebanon. This has been accentuated as studies and reports on alarming poverty rates, inequality and unemployment in the country became recurrent. The paper seeks to examine the social protection landscape in Lebanon from the lens of political economy, while taking into account debates on social protection on the international scene. The report provides an overview of the meaning of social protection and the competing frameworks tackling the concept and their policy implications. 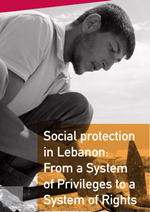 It also visits, in a non-exhaustive manner, the social protection landscape in Lebanon. Third, the paper attempts to place social protection within the wider political economy context in the country through depicting who benefits and who is harmed from the existing social protection system. The study lays out the existing debate on social protection policies on the international levels in order to draw lessons for Lebanon. Finally, the conclusion provides a way forward to achieve universal social protection in the national context.